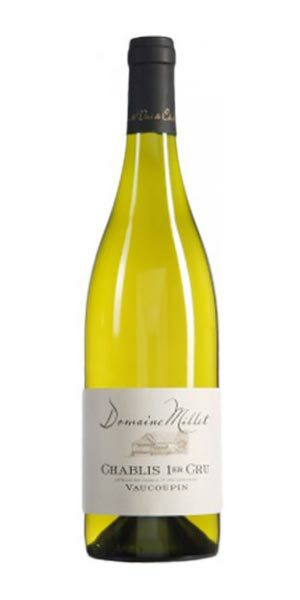 Domaine Millet makes great Chablis as a result of harvesting well cared for grapes at perfect maturity. The estate strives for typicity and authenticity in their wines by working with nature. Their approach to viticulture is sustainable and they only utilize protective treatments if absolutely necessary. The wine is vinified in stainless steel or enameled steel tanks exclusively to preserve the aromas of the Chablis “terroir” under the guidance of French winemaker Jean-Pierre Rodolphe Lédé. The wines exemplify finesse, elegance and freshness. The Chablis 1er Cru Vaucoupin is a steep, south-facing slope in the commune of Chichée. The soil here is about half and half limestone and clay. This Chablis 1er Cru Vaoucoupin has a light yellow colour, brilliant and luminous in the glass. The nose is pronounced with with generous fruity, floral and honey aromas. One senses power and elegance. The attack is fresh and light; giving an impression of purity. The medium bodied palate is characterized by notes of subtle richness and flavour concentration making for a refined wine with great length. This wine is enjoyable now and will offer lots of palate pleasure for the next five or so years.